When you want the look and appeal of a coal burning fire without the soot, smoke and ashes to clean up later, the best solution is the Modular Coal Set for the Legend Vantage gas fire. Once you adjust the heat setting on your Legend Vantage gas fire, there's no need to stir from your easy chair in order to keep feeding the fire with fresh coals. This Modular Coal Set for the Legend Vantage gas fire looks just like the real thing, keeping you and your family toasty warm, but without a speck of ash or dust to damage your furnishings or pollute the environment. For your convenience, this set is already completely joined together and includes front, side and rear coal strips, matrix and the authentic looking coals themselves. To complete the look you can position a hot coal bin next to your fireplace for decorative effect. 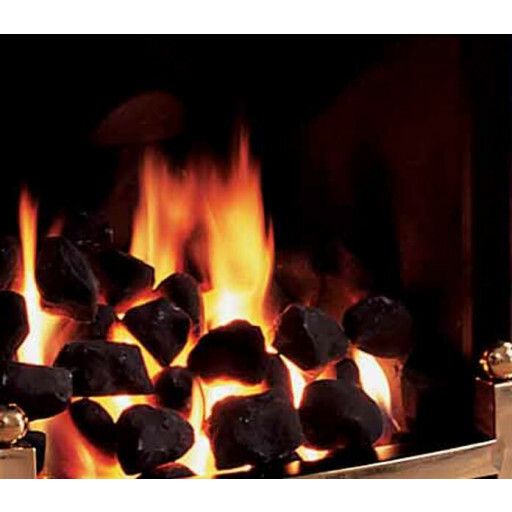 But you will never have to use it once you invest in this popular Modular Coal Set for the Legend Vantage gas fire. It's an essential fireplace accessory that is guaranteed to be durable as well as attractive, constructed from only the finest first-grade materials and guaranteed to suit any home décor.